What an increase! Turbo now can move at such a pace that all you see is a blue streak. But what a far-fetched journey he takes to realize his dream! 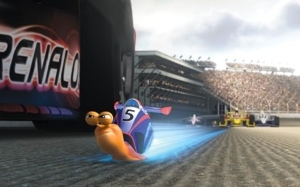 Of course this snail will be discovered at a snail race run by a half-partner in a taco business, and sure he’ll somehow communicate to this guy that he wants to race in the Indy 500, so why wouldn’t this kindly Mexican try to officially enter him in the race? And why wouldn’t the world watch this freakish phenomenon with grand interest? Turbo is turbo-charged with energy, colorful details, and enthusiasm. It’s the kind of film that will grab young viewers, and the racing scenes are every bit as spectacular as what we saw in Cars. 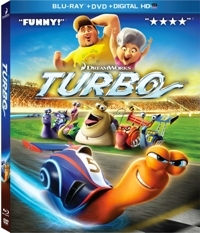 Yet, Turbo is a prisoner of its preposterous premise, because it takes so much creative energy just to make the main narrative remotely plausible that there’s clearly little left in the tank to come up with inventive side plots, sight gags, witty dialogue, and the kind of allusions that hold adults’ attention. A running gag about crows carrying off a snail one at a time is funny, but we could have used more of that sort of thing. There are some allusions and playful embracing of cultural stereotypes, but nothing near the cleverness of Disney’s Rattatouille—a similar tale about a rat whose passion was gourmet food, not garbage, and who dreamed of being a chef. But Turbo is much stronger than Disney’s Planes, and while parents may wonder if it’s the right message to send youngsters that no dream is too big for the dreamer—What about the kid with two left feet who aspires to be a dancer, the would-be pro baseball player with no natural athletic ability or coordination, or the wannabe rock star who can’t carry a tune?—Turbo is still a solid pick for family movie night. Adults and the teen and ‘tween in our family all liked it well enough to watch it again.